Heading to GDC this year? So are we! You can find the talented Ubisoft Toronto team in San Francisco giving in-depth talks throughout the week. From Game Design to Programming, some of our studio’s brightest minds will delve deep into their specialties to share their knowledge of shipping AAA titles. Learn about the soft skills game designers need to succeed at the “Beyond Game Design” talk by Ubisoft Toronto Game Director Richard Carrillo (Thursday, March 21 – 3pm). As the industry, moves forward into AAAA games, designers must step up to meet even greater challenges. But the greatest challenge revolves around leading these gigantic teams. The larger the team, the more minds there are to keep focused on a single vision. Even the best designers will fail without the soft skills necessary to lead. Your designs will be challenged all throughout development. Developers will lose faith, ideas will stray. How will you keep the team aligned to a common experience? How will you keep the team’s trust? In a truly subjective industry where millions of ideas could work, why should they believe in yours? 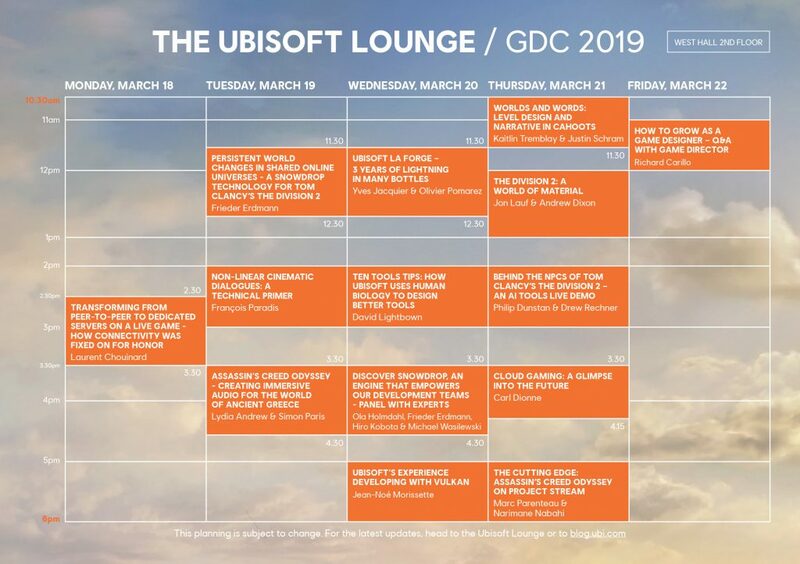 Ubisoft World Director Benjamin Hall and Thierry Dansereau (Art Director) explore the challenges they faced creating the world of Assassin’s Creed Odyssey in “Building a Living World from Ancient Ruins in ‘Assassin’s Creed Odyssey’” (Thursday, March 21 – 4:00pm). Team Lead Programmer Michael Wasilewski explains the work that went in to bringing the toys of Starlink: Battle for Atlas to life in his talk “Starship Physics and Controls that Feel Real” (Friday, March 22 – 11:30am). In Starlink: Battle for Atlas, one of our key pillars was that the digital ship should feel true to how children might play with its physical toy equivalent. This talk will cover how we brought the ships of Starlink to life – through a combination of specialized but reusable behaviors, designers can control how vehicles handle in multiple navigation modes, and how dynamic they look on screen. In addition, all week long you can find Ubisoft talent at the Ubisoft Lounge (West Hall, 2nd floor). Check out “Discover Snowdrop: An Engine that Empowers our Development Teams” panel with Michael Wasilewski, “Worlds and Words: Level Design and Narrative in Cahoots” to hear from Ubisoft Toronto Narrative Designer Kaitlin Tremblay and Team Lead Level Designer Justin Schram and “How to Grow as a Game Designer”, a Q&A with Game Director Richard Carrillo. Previous Post The Finalists: Ubisoft Indie Series presented by National Bank Next Post Announcing the 3rd Annual Ubisoft Indie Series Winners!